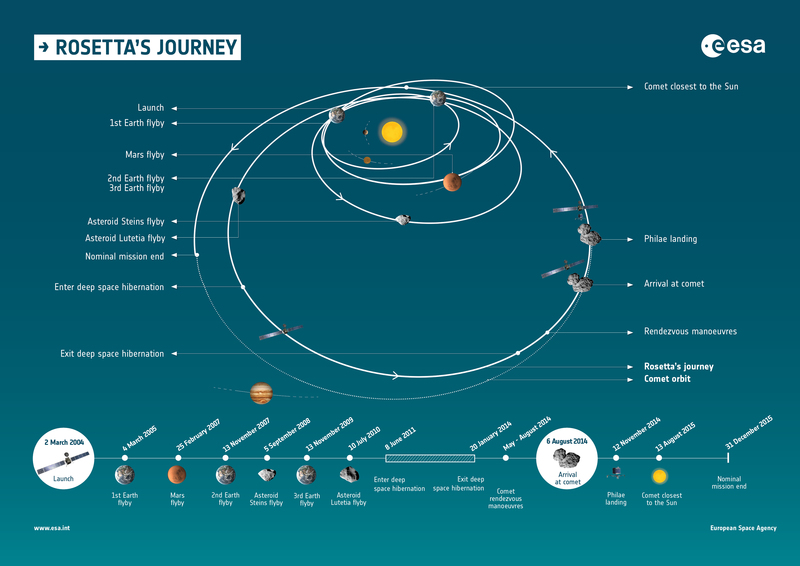 In May 2003, a new target comet and launch date for Rosetta were selected: the spacecraft was launched in March 2004 and arrived at its new target, 67P/Churyumov-Gerasimenko, earlier this year. Rosetta resembles a large black box. The scientific instruments are mounted on the top of the box (the payload support module), while the subsystems are on the ‘base’ (bus support module). On one side of the orbiter is the steerable 2.2 m-diameter communications dish, while the lander is attached to the opposite face. Two enormous solar wings extend from the other sides. Both panels can be rotated through ±180°. 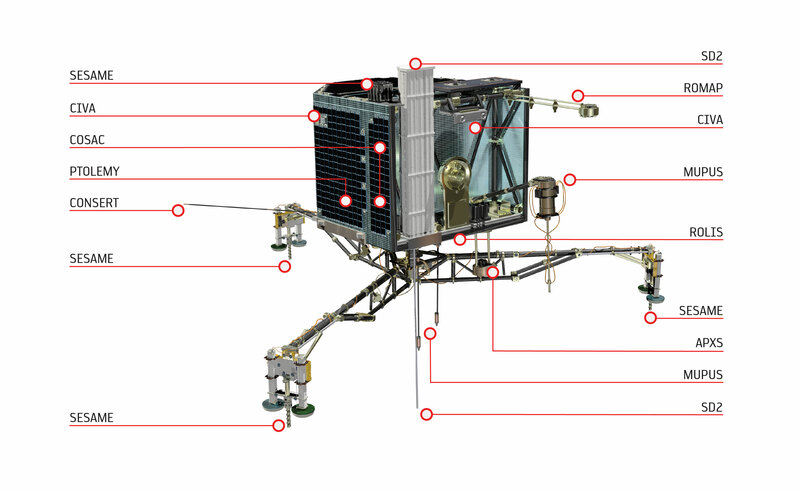 The orbiter’s scientific payload includes 11 experiments, in addition to the lander. Scientific consortia from institutes across Europe and the United States provided these state-of-the-art instruments. Ultraviolet Imaging Spectrometer – ALICE will analyse gases in the coma and tail and measure the comet’s production rates of water and carbon monoxide and dioxide. It will provide information on the surface composition of the nucleus. Comet Nucleus Sounding Experiment – CONSERT will probe the comet’s interior by studying radio waves reflected and scattered by the nucleus. Cometary Secondary Ion Mass Analyser – COSIMA will analyse the characteristics of dust grains emitted by the comet, such as their composition and whether they are organic or inorganic. 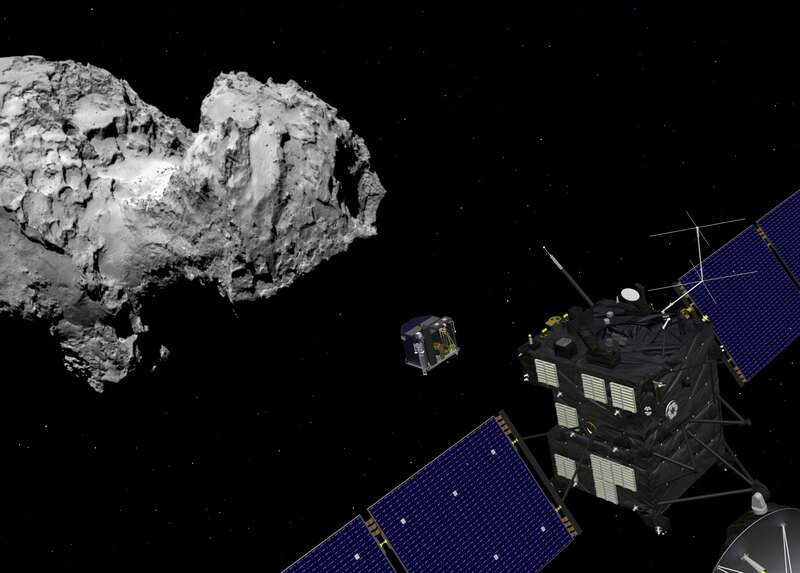 Micro-Imaging Dust Analysis System – MIDAS will study the dust around the comet. It will provide information on particle population, size, volume and shape. Microwave Instrument for the Rosetta Orbiter – MIRO will determine the abundances of major gases, the surface outgassing rate and the nucleus subsurface temperature. Optical, Spectrocopic and Infrared Remote Imaging System – OSIRIS has a wide-angle camera and narrow-angle camera that can obtain high-resolution images of the comet’s nucleus. 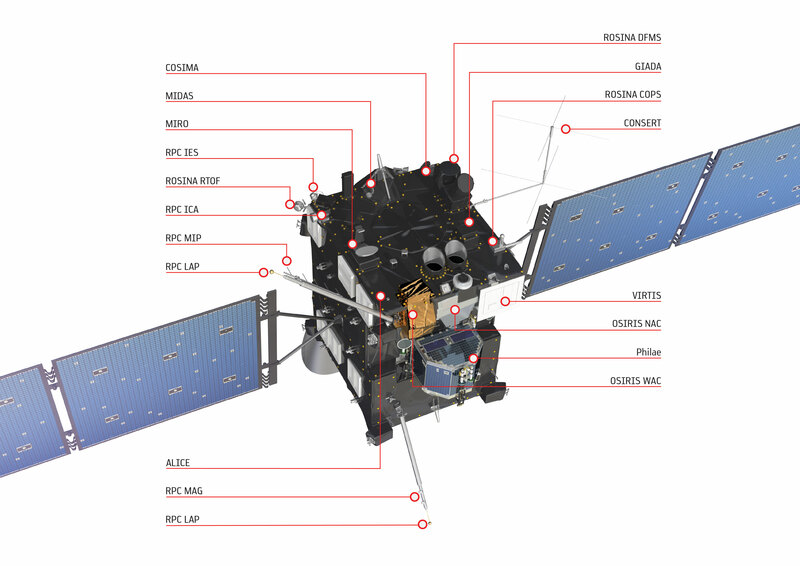 Rosetta Orbiter Spectrometer for Ion and Neutral Analysis – ROSINA will determine the composition of the comet’s atmosphere and ionosphere, the velocities of electrified gas particles and reactions in which they take part. Rosetta Plasma Consortium – RPC will measure the physical properties of the nucleus, examine the structure of the inner coma, monitor cometary activity, and study the comet’s interaction with the solar wind. Radio Science Investigation – RSI will, by using shifts in the spacecraft’s radio signals, measure the mass, density and gravity of the nucleus, define the comet’s orbit, and study the inner coma. Visible and Infrared Mapping Spectrometer – VIRTIS will map and study the nature of the solids and the temperature on the surface. It will also identify comet gases, characterise the physical conditions of the coma and help to identify the best landing sites. Alpha Proton X-ray Spectrometer – Lowered to within 4 cm of the ground, APXS will detect alpha particles and X-rays to gather information on the elemental composition of the comet’s surface. a CCD camera that will obtain high-resolution images during descent and stereo panoramic images of areas sampled by other instruments. Six identical micro-cameras will take panoramic pictures of the surface. A spectrometer will study the composition, texture and albedo (reflectivity) of samples collected from the surface. Evolved Gas Analyser – MODULUS PTOLEMY is another evolved gas analyser that will obtain accurate measurements of isotopic ratios of light elements. Comet Nucleus Sounding – CONSERT will probe the internal structure of the nucleus. Radio waves from CONSERT will travel through the nucleus and will be returned by a transponder on the lander. Cometary Sampling and Composition experiment – COSAC is one of two ‘evolved gas analysers’. It will detect and identify complex organic molecules from their elemental and molecular composition. Multi-Purpose Sensor for Surface and Subsurface Science – Mupus will use sensors on the lander’s anchor, probe and exterior to measure the density, thermal and mechanical properties of the surface. Rosetta Lander Magnetometer and Plasma Monitor – Romap is a magnetometer and plasma monitor that will study the local magnetic field and the interaction between the comet and the solar wind. Sample and Distribution Device – SD2 will drill more than 20 cm into the surface, collect samples and deliver them to different ovens or for microscope inspection. Surface Electrical, Seismic and Acoustic Monitoring Experimens – SESAME’s three instruments will measure properties of the comet’s outer layers. The Cometary Acoustic Sounding Surface Experiment will measure the way sound travels through the surface. The Permittivity Probe will investigate its electrical characteristics, and the Dust Impact Monitor will measure dust falling back to the surface.